Steve will be joining us at Hebrew class this Tuesday from 6:00 p.m. to 8:00 p.m. He is able to stay in town a bit longer than he had anticipated. YAY! As usual, we’ll start by having a bite to eat (bring something to share or brown bag your own), then we’ll practice a dance for Passover, and finally, we’ll settle in for Hebrew class. A little birdie told me we may also be treated to a worship song by Tom & Lynne this week! 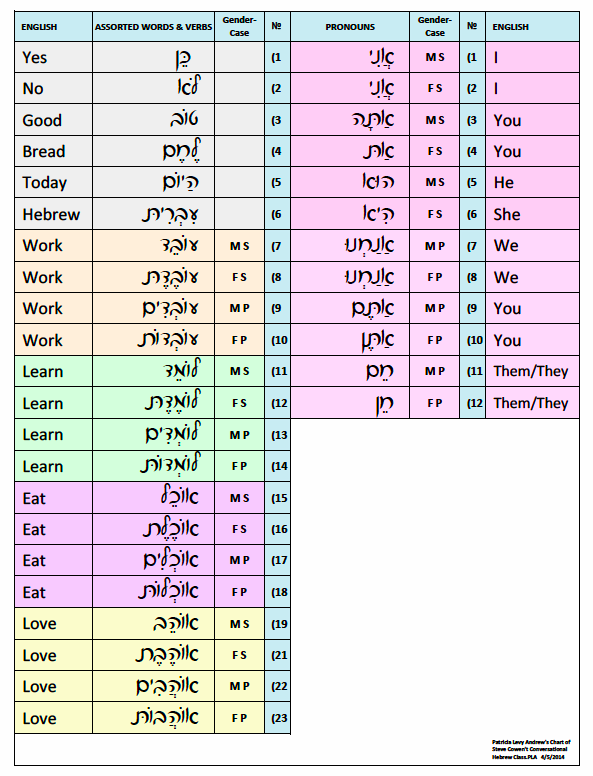 Note: I’ve edited the vocabulary chart (I had earlier neglected to list the final two pronouns Hem and Hen). Remember to read, speak, and write each word. You can use the sheet like a flash card simply by covering up the translations. Contact us for class location information. What Gives with All the Giving?